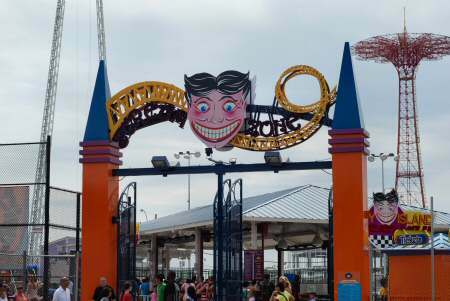 If you live in the New York Metropolitan area or even neighboring states like Connecticut, Massachusetts, New Jersey, Philadelphia, Delaware, Maryland or Northern Virginia you might want to consider taking your kids to Coney Island in Brooklyn, NY. After all, it’s summer vacation now and your kids must be getting bored stiff. Coney Island is on the southern edge of Brooklyn, one of the five boroughs of New York City. The place is not far from Manhattan, just a 50-minute ride on the subway from the Times Square-42nd St station in midtown Manhattan. 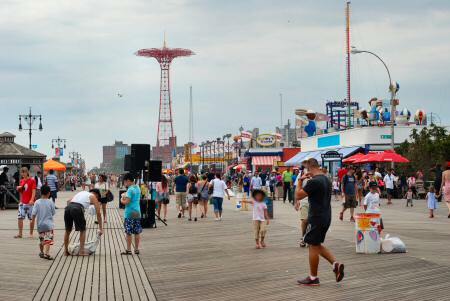 Kids have lots to enjoy at Coney Island – the various amusement park rides (Ferris Wheel, Soaring Eagle etc), the boardwalk, the famous Nathan’s hot dog store and, more than anything else, tons of sand and the big, blue sea. There’s also the New York Aquarium to visit in Coney Island (at Surf Avenue & W. 8th Street, NY 11224), if you’re into ‘fishy’ stuff. If you’re planning a visit to Coney Island, I’d recommend you set aside a day (including travel time) so that you don’t feel rushed. The boardwalk (and the road leading to it) has lots of food shops where you can grab a bite to eat or a cold drink to quench the thirst and beat the heat. Be warned thought that on summer weekends the Coney Island boardwalk can be crowded. 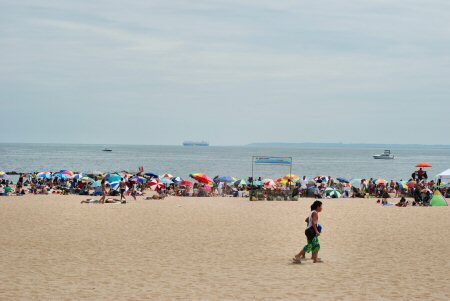 I was at Coney Island recently and found plenty of kids on the boardwalk and, further afield, on the beach. 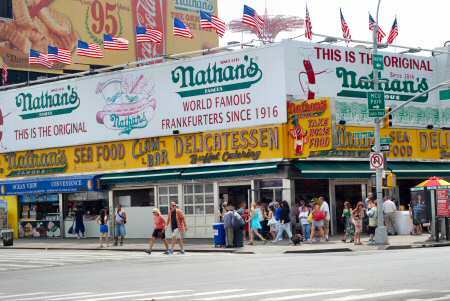 I was very keen on having a hot dog at the world-famous Nathan’s hot-dog place at the corner of Stillwell Ave and Surf Ave (see below). But the crowds and time-pressure forced me to defer it for a future visit. There’s a Nathan’s on the boardwalk as well but the restaurant on Stillwell Ave-Surf Ave is the original place. If you happen to live in Manhattan, Queens or Long Island, you won’t be spending a lot getting to Coney Island. It’s so much more fun than getting to a mall and lazing around there or heading out for a movie. My suggestion is to take the train because parking can be a bit tight there, particularly in summer. 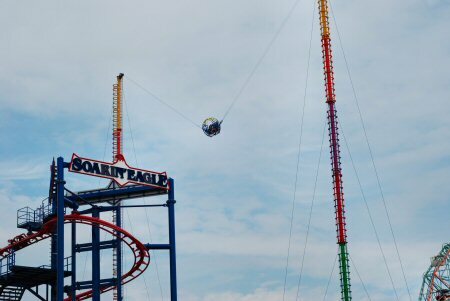 Here are more pictures I took during my recent visit to Coney Island. 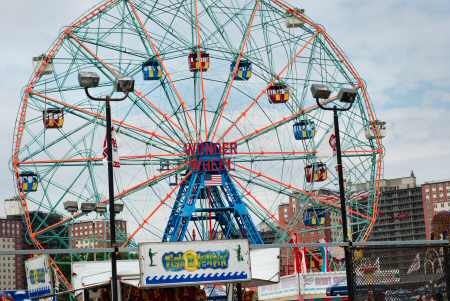 Take the N or Q train from 42nd St-Times Square and get down at the last stop, Coney Island-Stillwell Ave.
From the Coney Island train station stop to the boardwalk and amusement park rides is no more than a five-minute walk. 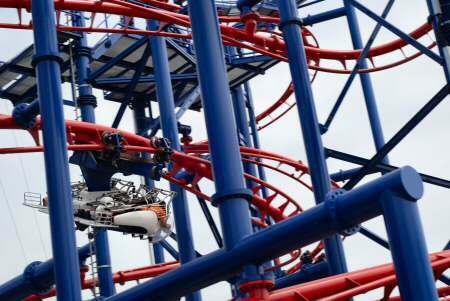 Have fun at Coney Island.